IT’S THAT TIME OF THE YEAR AGAIN EVERYONE……. 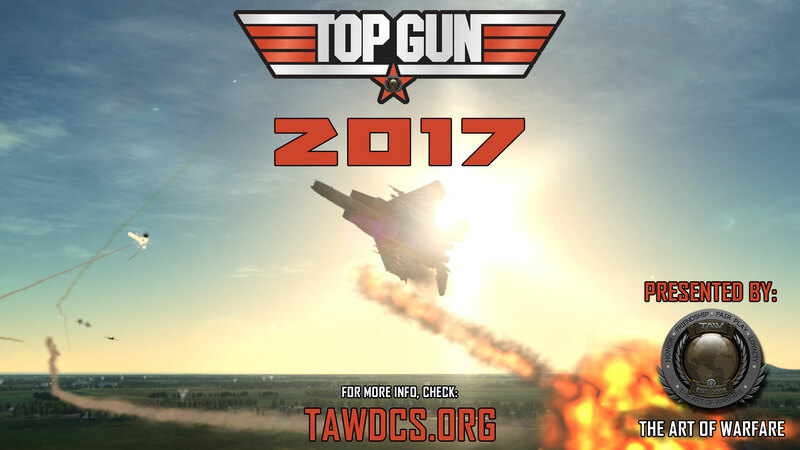 We are back with ROUND 4, but it will be called TOP GUN 2017 from now on and the years will obviously increase in the future. DOWNLOAD THE MISSION FILE HERE !! 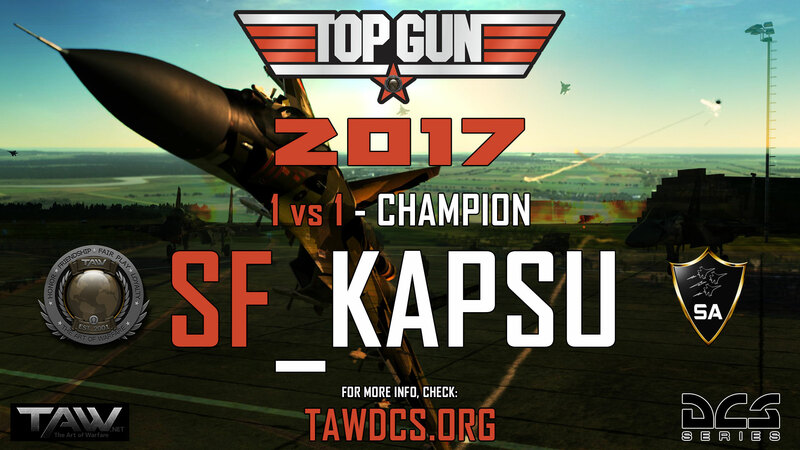 The Top Gun event is in its fourth incarnation and has been an intense and awesome event so far. This has provided us with some of the best dogfighting we’ve ever seen. 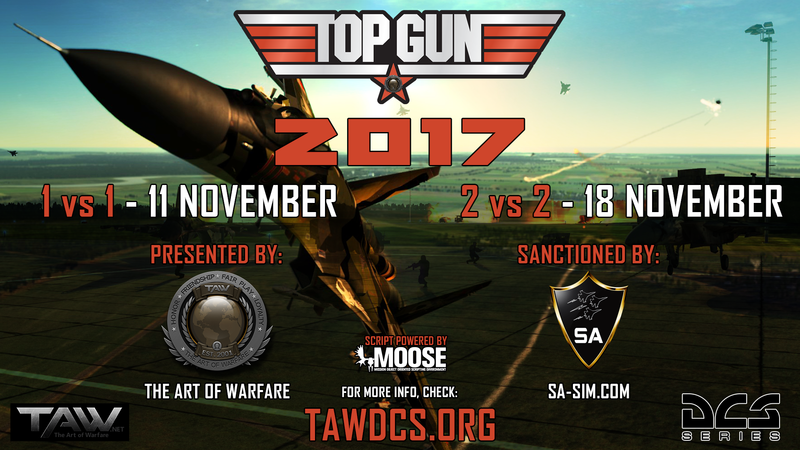 This event has been created, planned and will be hosted by TAW (The Art of Warfare) in association with Situational Awareness. Therefore ladies and gents it will count towards your SA ranking. The formula is the same as last year, but make sure you read the rules to get an understanding of how it will work. The event will be split into TWO separate competitions, a 1vs1 and a 2vs2. 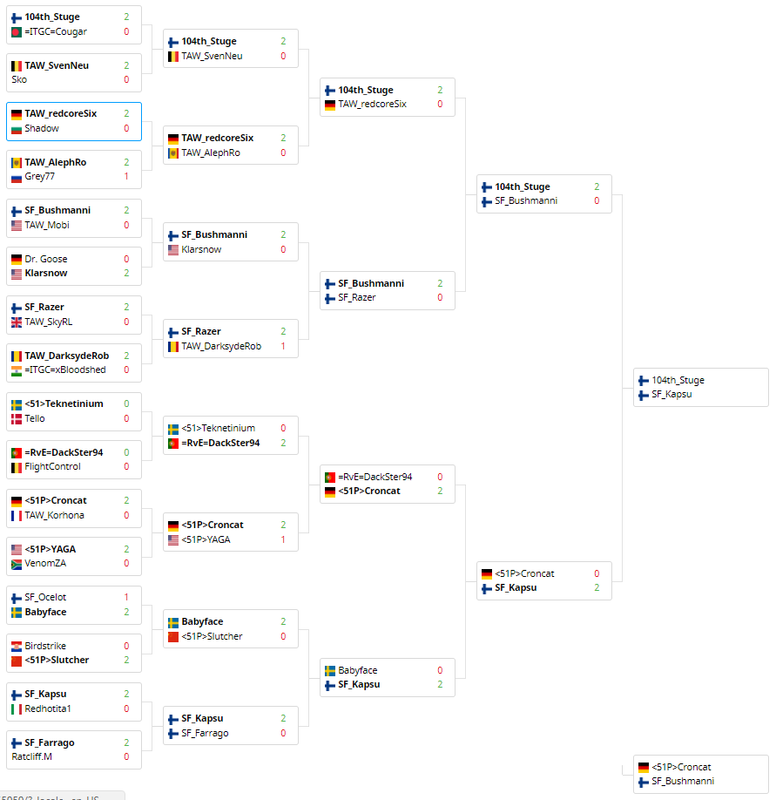 For the 1vs1 competition we have 32 slots to fill and for the 2vs2 we are going to get 16 teams (32 slots). 8 slots from each competition have already been reserved for invitees. Once signed up, pilots will then be sorted and assigned matches. Every match will be best of 3 rounds, i.e, first pilot/team to win 2 rounds will be declared winner. The Final Fight will be first pilot/team to win 3 rounds (best of 5). Pilots will spawn in a 50km diameter combat station (bubble); the goal is to destroy the opponents or force them out of the bubble. A warning message and sound will alert pilots when getting within 5km from the borders. A trigger will blow up any unit flying out of the combat zone if there is still an opponent flying. If all opponents are down, exiting the bubble will declare you winner of the round. If the hosting server crashes before a winner is declared, the round will have to be restarted; only one client-side disconnection per pilot/team is eligible for a round restart; any further disconnection will count as a loss regardless of when it happened. If a client disconnects after the first merge, it will count as a loss. If a client side disconnection happens before the first merge, the round shall be restarted. Pilots must use the same aircraft until the match is over but can fly a different one in the next match. Print screening is forbidden, server will notify admin when someone is print screening; this is a serious breach and will result in an immediate round loss; any further print screening will result in a disqualification. Ping Limit is set to 400ms. Players can swap sides after each round. In case of a dispute, tracks will have to be provided. The admin’s decision will be final. Tracks from participants may also be required whenever deemed necessary; failure to provide a track when asked for will result in the loss of the round. 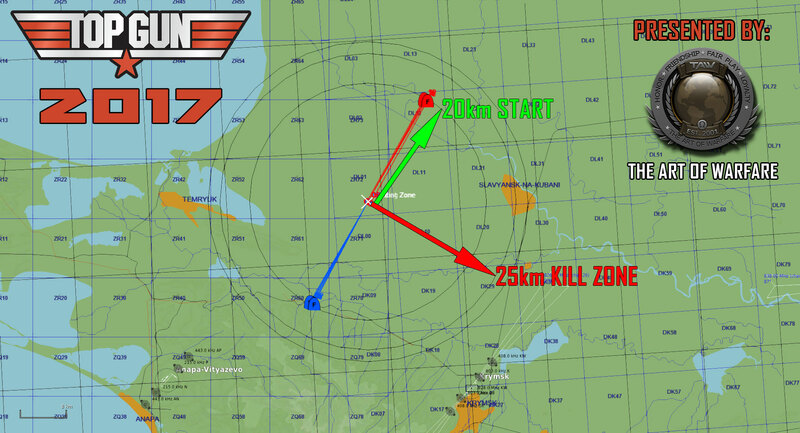 Pilots will be provided with 2 heat seeking missiles (SU27/33 – R-73, F15C – AIM-9, M2K – Magic) and their aircrafts gun, all of which will be employed post merge only. 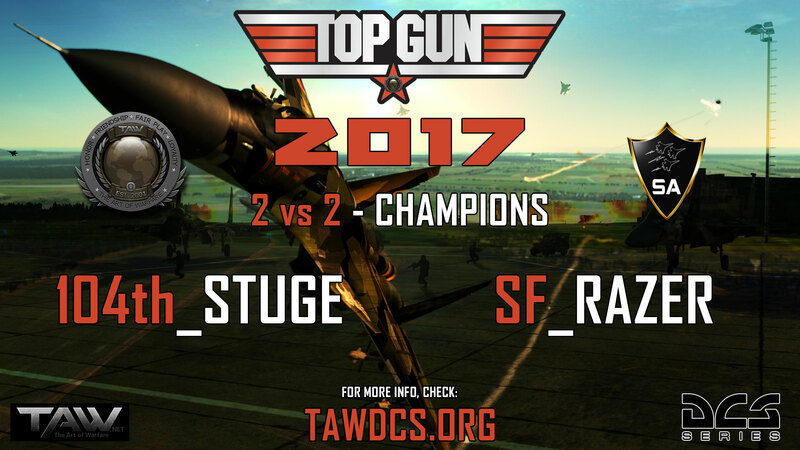 Pilots will be equipped only with their GUNS ONLY, in traditional Top Gun fashion, again firing post merge only. 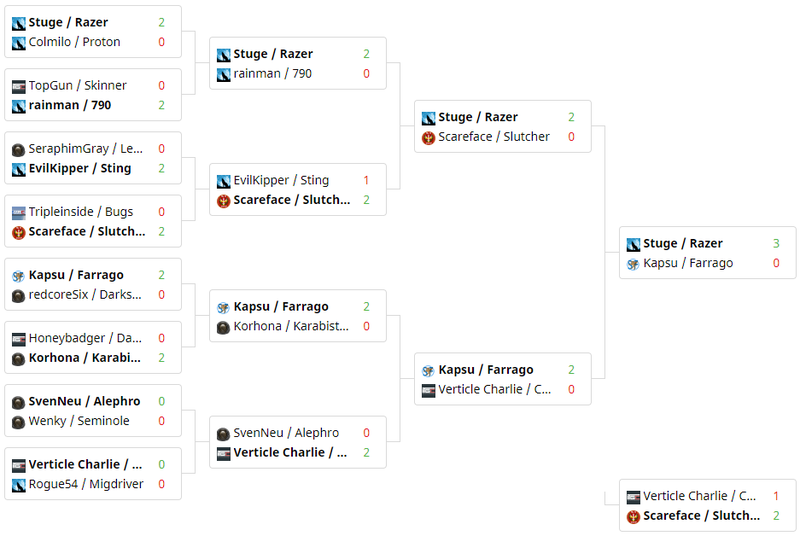 If after round 2 the score is tied then we repeat round 2 GUNS ONLY to get our winner. Pilots will be provided with 2 heat seeking missiles (SU27/33 – R-73, F15C – AIM-9, M2K – Magic) and their aircrafts gun, all of which can be employed pre merge. Pilots will be equipped only with their GUNS ONLY, in traditional Top Gun fashion, again firing can be pre merge. We strongly believe in showing good sportsmanship, therefore all matches will have a referee who will orchestrate the match and resolve any issues that may arise during. You will not be allowed to switch airframes once the match has started, you must complete all three rounds with the same airframe. You can change airframes in between matches. For attendance to the event itself, you must show up 30 minutes before your match begins, if you aren’t present in the TeamSpeak lobby 30 minutes before your match then we will already contact reserves. If you do not show up 15 minutes before the match someone from the reserve list will fly your match. If no reserves are available, then the match will be ruled as a walkover win. It’s very important that we keep the event running, so that others will not suffer for someone else’s tardiness. Alot of organisational work goes into preparing an event like this, therefore we need to stick to a strict timetable to keep everything running smoothly, we hope you understand the reasons for the above. Finally, keep yourself up to date with the event by checking the thread here, just in case any changes are made. Have fun! Anyone and everyone is welcome to sign up to the event, for 1vs1 and 2vs2, it doesn’t matter how skilled or unskilled you think you are. Simply visit the relevant signup form below and enter your details in, once done, hop back to the thread here and just post your callsign into the thread so we can contact you easily if necessary. !!! REGISTRATION IS CLOSED as of November 1st 2017!!! We strongly encourage you to sign up even if you believe that we have reached our limit for players, we’ve noticed plenty of AWOL’s at past events so we therefore want a strong reserve list! Where do I join Team Speak?